The CL-200A Chroma Meter concurrently measures the chromaticity of light sources such as LED, Organic LED (OLED), and other forms of Organic Electroluminescence (EL) as well as color temperature and illuminance. The CL-200A Chroma Meter, the next generation to the CL-200, measures the chromaticity of light sources such as LED, Organic LED (OLED), and other forms of Organic Electroluminescence (EL) as well as color temperature and illuminance. The measure of color temperatures are an important part of determining the correctness of a LED’s illumination. The CL-200A incorporates precision sensors coordinate with the International Commission of Illumination (CIE) defined color matching functions; the results are displayed in a variety of application specific color notations. This device is crafted for the purpose of producing greatly reliable color temperature measurements, especially for white LEDs. The design of the CL-200A has the capability of inspecting the output light quality while measuring the chromaticity from the phosphor of a completely assembled white LED. The CL-200A Chroma Meter is a compact device created to fit comfortably in the palm of your hand. The design includes easy portability and is battery operated. 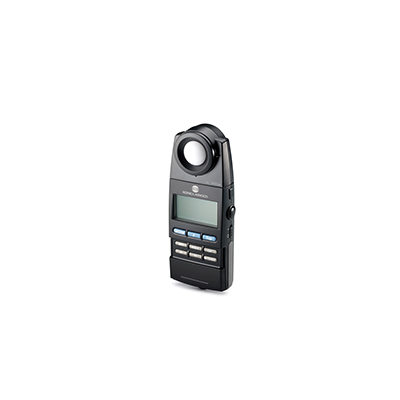 This chroma meter comes equipped with a low battery indicator and is rechargeable battery friendly. CL-S10w Data Management Software, which includes the Japanese Industrial Standard (JIS) calculations ranking function, is provided with the CL-200A making it easy for users to transfer data to Excel. The instrument can also be connected and operated directly through a personal computer. The receptor head can be removed from the main body and can be used in darkroom boxes or installed in an inspection system. Data is collected by connecting the receptor and body via a LAN cable. The CL-200A Chroma Meter features the ability to collect multi-point measurements by using up to 30 receptor heads along with the user friendly calibration function. The calibration function provides the ability to compare measured values to a specific sample. The Cl-200A Chroma Meter works ideally in situations requiring lighting production and adjustment, color-viewing cabinet maintenance, utilization as a photographic color meter, measuring projector light sources, LED billboard development and maintenance, and the evaluating the light distribution of LED illumination fixtures or models. ∗Specfications are subject to change without notice. ∗Company names and product names mentioned here are the registered trademarks or trademarks of their respective caompanies.